From Stornoway Town Centre, walk north (with the Harbour to your left) along Cromwell Street. The road becomes Bayhead after the junction with Kenneth Street. At the head of the Harbour you will see the YM Bridge sign posted to the Castle Grounds (see image above). Walk over the bridge and turn left. 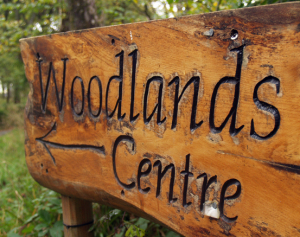 Walk along the path with the water on your left until you see the Woodlands Centre and Cafe ahead of you. Our office is to the rear of the building. Head to the roundabout on the junction of Matheson Road, Bayhead, and Macaulay Road. Travel north along the A857 (Macaulay Road) and take the first left onto Willowglen Road, followed by an immediate left into the Castle Grounds. 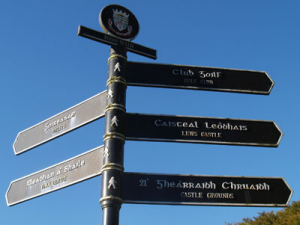 Passing through the entrance gate you will pass the Stornoway Golf Club on your left, continue straight on for about quarter of a mile until you see a sign to the Woodlands Centre, turn left down the hill and at the bottom make a hard right into the car park. Our office is to the rear of the building.